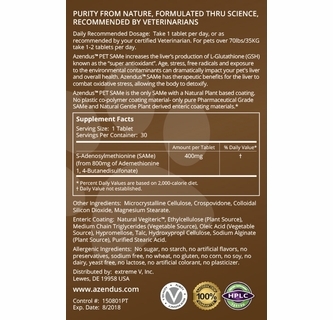 PURITY FROM NATURE, FORMULATED THRU SCIENCE, RECOMMENDED BY VETERINARIANS. Daily Recommended Dosage: Take 1 tablets per day, or as recommended by your certified Veterinarian. For pets over 70lbs/35KG take 1-2 tablets per day. 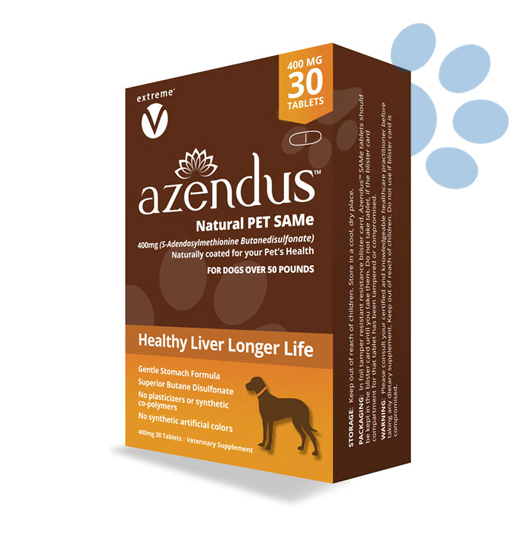 Azendus™ PET-SAMe supports the replenishment of S-Adenosylmethionine levels and balances the interactions of your pets liver health and detoxification. 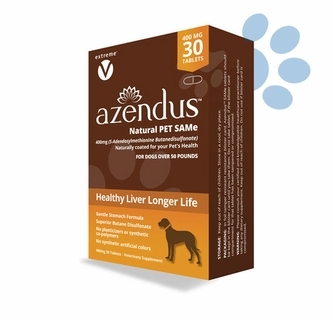 Azendus™ PET-SAMe significantly increases the liver’s glutathione level. This is critical because glutathione is the chief antioxidant produced in the liver, also known as the “super antioxidant”. Age, stress, free radicals and environmental conditions can dramatically impact the liver’s health and accelerate the aging process. 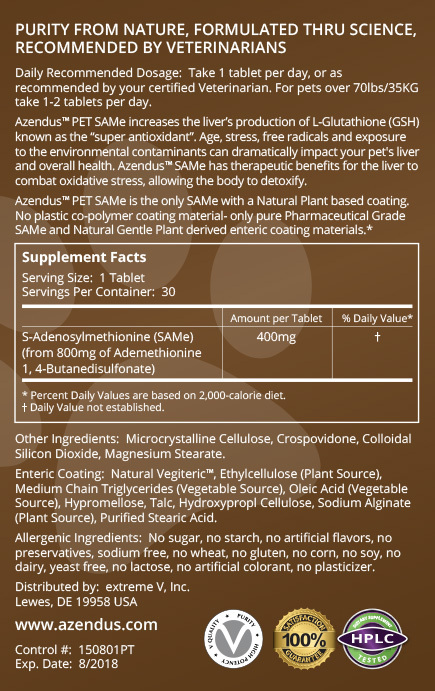 Azendus™ SAMe is converted into glutathione, thus having the therapeutic benefits for the liver to combat oxidative stress, cellular damage, free radical activity and DNA breakdown, allowing the body to detoxify. Get a better product for half as much!! I have had my dog on Denosyl and then onto Denamarian but they are so expensive from my vet! 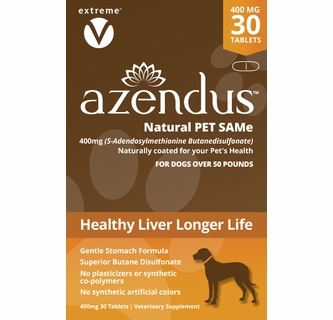 My friend who has switched onto Azendus Pet told me your product is not only all natural, but is also cost much less. 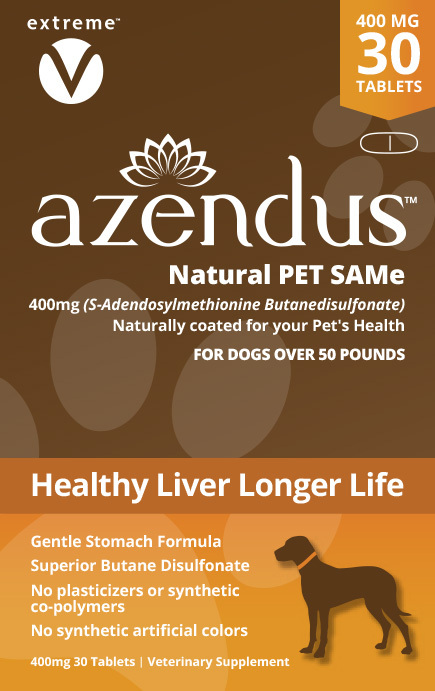 My Doberman has cirrhosis and has improved dramatically on this supplement.